What is it? What is it for? How is it done? Baci Ceremony (also spelt Basi) is specific ceremony in Laos which has been practiced for hundreds of years. The term commonly used is “Sou Khuan” which means “spirit enhancing or spirit calling”. The ceremony involves the tying of white cotton strings around person’s wrists and the prayer saying or well wishing for the person that the ceremony is intended for. Lao people believe that a human being is a union of thirty-two organs, each has a spirit or Khuan (Lao word for spirit) to protect them. These spirits often wander outside the body causing unbalance of the soul which might lead to an illness. The tying of the white string represents tying of the 32 spirits to the body putting them back in harmony as well as bringing good luck and prosperity. What is Baci ceremony for? The Baci ceremony is held on many different occasions or events through out the year. It can be held any day of the week though it has to be on a good day in the lunar calendar. These good days are known to elders, senior monks, or ex-monks. The ceremony can be held for both sad times and happy times. Some people might find it a little strange that there is a ceremony for sad occasions. Read on and you will find out. The ceremony is held for happy occasions like weddings, welcoming guests, Lao New Year, house warmings, home comings and other such occasions. A mother and her new born baby are given a Baci, after the mother has recovered, to welcome the baby as well as to call back the spirits of the mother’s that might be wandering away through the child baring. The ceremony is also held to raise spirits when someone is weak (physically and spiritually). After someone in the family has passed away a Baci ceremony is held as it is believed to enhance the spirits and reinforce the harmony of the rest of family members after having been through sad time. Before a ceremony takes place, elderly women in the community gather to prepare a Pha Khuan, handmade marigold pyramid, which is a key centerpiece at every Baci. Now, in cities it can be bought from markets. The Pha Khuan is placed on a white cloth at the center of the room and everyone gathers round it. 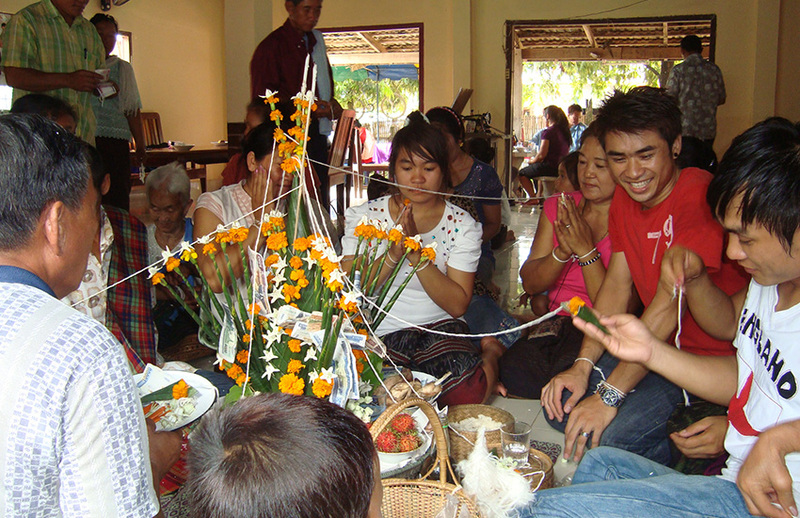 The host or the persons that the Baci is intended for sit closest to the Pha Khuan facing the Mor Phon (wisher or master of ceremony usually a respected and knowledgeable person in the community), and other participants sit behind. Starting by “Mor Phon inviting” session which is usually performed by one of the elderly men. He places a glass of Lao whisky and small amount of money, wrapped in banana leaf together with a pair of candles and flowers, on one hand and ties a white string around the wrist of the Mor Phon while murmuring words to invite good wishes. 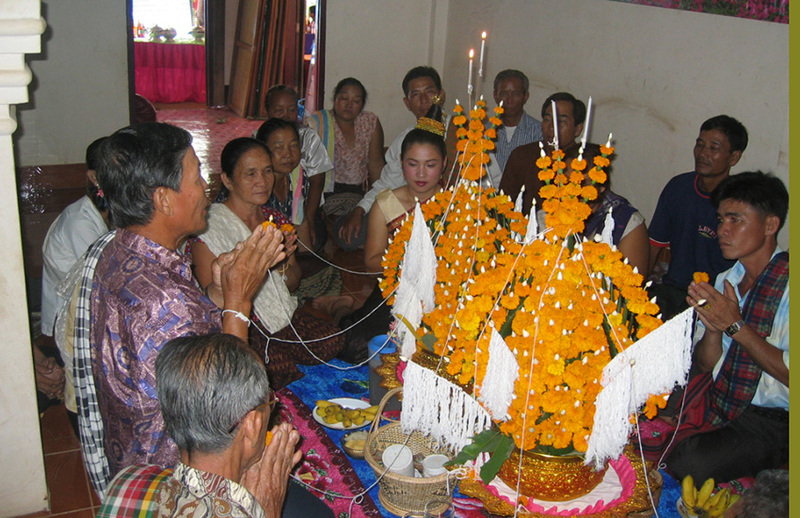 After that, the Mor Phon starts by lighting the candle on the top of the Maak Beng (handmade marigold pyramid made of banana leaves & flowers) and asks the host or the persons to receive the blessing to lay their hands (palms down) on the edge of the Pha Khuan. He brushes their hands with the white strings saying "Hai Kuard Nnee, Dee Kuard Kao" meaning "bad is swept out, good is wept in". After this he takes the white thread connecting the Pha Khuan, placing one end in his hand and the other in the hand of the person who is to receive the blessing. They place the string between their palms and pray while the Mor Phon is chanting in the religious Pali language, sometimes quoting from Lao poetry and proverbs. During this time everyone is supposed to be quiet. At some point during the chanting, the ceremony attendants say together “Ma Der Khuan Euy” meaning “please come spirits”. At the same time someone throws rice in the air so the rice grains fall down on everyone’s head. These rice grains represent the spirits and good luck that have been asked for. After the Mor Phon has finished his chanting, he ties the first white blessing strings around the wrists of the main person being honored. Then everyone else joins in to tie strings around the wrists of the main celebrants and other family members as well as among the guests themselves, while murmuring good wishes for receivers of the strings. Some roll up a bank note and tie it inside a white string then tie around the wrists of the host, while others just place a glass of Lao whisky, fruit, an egg or any edible thing available on the Pha Khuan on the hand of the person and tie a string on the wrist. The Baci ceremony finishes when everyone has tied the white strings around everyone else’s wrists or when the white string has run out. The ceremony varies in length from 30 minutes to one hour. Some times, at the end of the ceremony the Mor Phon and the elderly people do their little prediction by looking at chicken wings, claws and jaw. An example of the prediction that I often hear is that, if all the claws are neatly pointing to the same direction the spirits of the receivers of the blessing are all well and stay with them. Usually, after the string tying procession has finished everyone is invited to eat, drink and some times dance (Lao circle dance) with a live band playing. 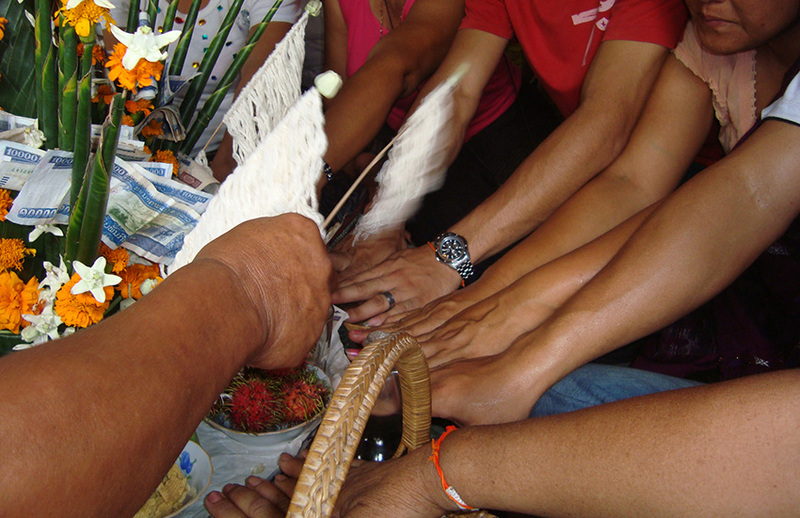 It is believed that if the receivers of the blessing want their wishes to come true, they should keep the white strings tied around their wrists for at least three days after the ceremony. When it comes time to remove them, they should untie instead of cutting the strings as the good wishes might be severed. After the ceremony, the Pha Khuan is kept until it dries out or at least for three days before it is thrown away. The reason is the same as keeping the white string tied around the wrists. The Baci ceremony varies throughout the country in terms of orders of sessions and its meaning.